With our New Year New Me Challenge beginning we realize that you will be doing more than just coming into our gym and working-out. The foods you choose to fuel your workouts will have a great impact on your progress. Making a fresh and healthy home cooked meal may be ideal but eating out is inevitable. 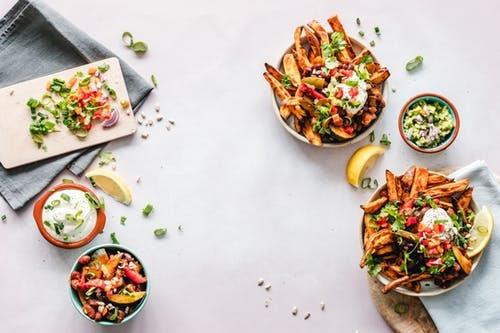 For when you go out to grab a bite to eat we recommend you try one our favorite restaurants along with what we deem to be their most health friendly option. This restaurant is a perfect place to grab a balanced and fresh meal. Their Miso Salmon Bowl is great in particular for it is filled with healthy fats, protein, plenty of veggies and just the right amount of cards. If you want a drink to accompany your food, try an unsweetened black tea. In case you want to treat yourself a bit, we have to admit, their organic agave pineapple berry lemonade is delicious. Here you can build a delicious wrap, salad or bowl. By having the power to individually customize your food, you can make the ultimate healthy meal. As expected getting a salad is your best options. We recommend that you adjust your toppings to fit your needs for the day. Perhaps if you had a great workout, increase the protein and if you haven’t had much fat that day, add some avocado. Our favorite tips for building your own are- bulk up on veggies, get you dressing on the side and get Kale salad as your base. There is nothing like a fresh smoothie or bowl after a session our gym. If you want to grab something that does not have unnecessary added sugar and contains nutrient dense ingredients check this place out. Their super food bowls are great in particular since it combines a delicious smoothie with healthy and hearty toppings. You can’t go wrong with any of their options, but we find the monster and matcha to be delicious in particular. If you are on the road and do not find yourself around one of these amazing eateries, check out our post on healthy options at fast food restaurants for some inspiration. + One Free Training Session! Tell Us What Your Goals Are.